I have come across a Celestron C8+ in pretty good condition. Seams to me that the only problem is that the tracking motor does not work and the DEC slow motion knob keeps falling off. Does anybody know how to fix these problems or know where to go to find replacement parts? And does anybody have any more information on this scope that would be helpful for me to know? This information would be greatly appreciated, thanks. Welcome to Cloudy Nights and the Classics forum. I can't answer your question personally, but you are in the right place to get an answer. Someone in this group can surely point you in the right direction. You might also try asking in the "Cats and Casses" forum where all of the CAT folk hang out. This is a list of links to most of the previous discussions in this Classics forum about various classic scopes, including your C8. The list is broken down by manufacturer, not model. You'll have to go down the list of the Celestron links and start clicking on them. 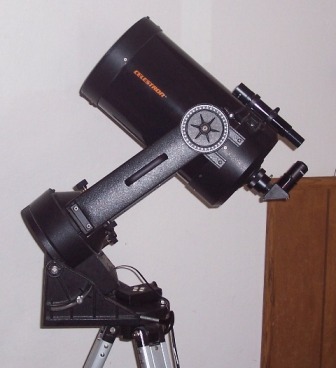 Many of the Celestron links are about the C8. You may find an answer there. And of course, if you have photos, we love to look at them. Just check the photo posting guidelines pinned to the top of the forum. Probably your best bet in finding out about older Celestrons and SCTs in general is Rod Mollise's website. He has a nice page on older SCTs (Buyers Guide)that is worth reading and his book, Choosing and Using the Schimtt Cassegrain Telescope is the best on the subject. Rod is very friendly and helpful so he could point you in the right direction to get your drive fixed. It turns out that the motor was fine in the telescope and it was just some loose wiring in the motor and alls I had to do was unhook the cable and plug it back in and it turned right on and started tracking. And all the DEC knob needed was tightening with an Allen wrench. Wish I knew that before I had to crawl under the deck in my backyard at 10:30 at night to recover a small brass fitting that came off when the knob did. O well, you live and you learn. Next stop is a laser mount and some eye pieces and photography equipment. Wish me luck!